Right, Wing-Nut! : Will Shawty Lo Deliver The Fatal Blow In The Culture War? Will Shawty Lo Deliver The Fatal Blow In The Culture War? Shawty Lo (real name: Carlos Walker) is a rapper out of Atlanta's Bowen Homes housing project. A self-confessed drug runner and thief who spent much of 2004-'05 behind bars, Shawty founded D4L Records (with the drug money), and found some success both as a member of the eponymous rap foursome and as a solo artist. And for that, the Oxygen Network - partially founded by Oprah Winfrey, and whose original mission statement was to "empower women"(!) - is giving him his own reality show. Surely there has to be a line out there somewhere—a level of degradation, of downright sewer-level grossness, that is so low even a television network will not sink below it to make a couple of bucks. 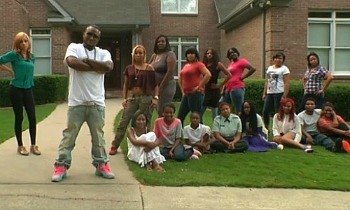 I would have thought that rapper Shawty Lo’s new show, “All My Babies’ Mamas,” was solidly below the sewer line, a revolting theater of ghetto indecency so embarrassing that even a desperate cable station would deem it beneath them to put it on their airwaves. But apparently this skin-crawling mess is about to be available on your local dial, thanks to the fine folks at the Oxygen network. As a community, we let Shawty Lo happen. Where were the older men to pull Mr. Lo aside and counsel him about the irresponsibility of his actions, maybe after baby number three? To make him understand the difficulties he was setting up for all those children—and himself—by his wanton sperm? Where were the older women to counsel all those baby mamas? To start warning them after he had impregnated maybe three or four that there wasn’t much of a future with a modestly talented rapper whose career hadn’t ever really popped? That any children of theirs deserved more? But clearly the community never stepped up. Nobody told Shawty about the existence of condoms. None of those words ever made their way to the right ears. Did anyone tell Ashlin she's next? We all failed those children. So has your political party of choice, by the way. We punish hard-working married couples with additional tax burdens, in order to pay for the lifestyles of these whores and their pimp. But it will be their children who will suffer most, with no real dad, no real opportunities...and the scars of media exploitation at a young age. Normally, I'd go into a rant here about needing to change the way black people vote, but I've been there and done that, to no avail. I'm not going to watch “All My Babies’ Mamas”...but I will sit back and watch the decline.